Age Recommendation: Advanced Young Adult Readers (12ish) and UP! A young man and his mother fight to leave tragedy behind. Striving for a new life on Mars has cost Tim and Patricia everything, but as even their future is taken from them, their past is just beginning. Earth: population 50 billion. Pollution, crime and scarcity are out of our control. Instantaneous travel provides hope for the terraforming of another world. A terrorist attack. An explosion at the event horizon of a wormhole. A murder. A trail of clues, misinformation and sabotage. Nothing is as it seems as an old enemy returns from the shadows. 100 years from now, the 100 souls aboard the USS New World are thrown back 100 million years to the deadly Cretaceous Period. From there, an epic fight to save humanity begins; but first, they must survive. A multi-national, eclectic crew; among them the good, the not so good and the no damned good at all. Loss, courage, genius and sheer bloody-mindedness bind them. NASA Captain, James Douglas, and his first officer, Jill Baines, expected a taxi run to Mars. 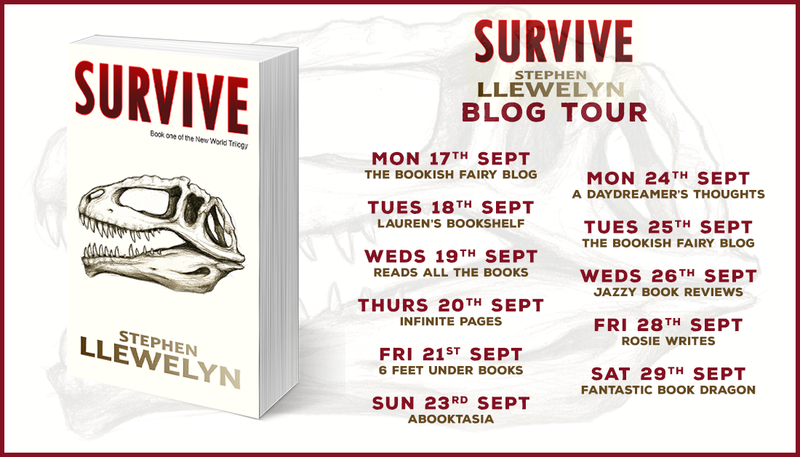 Now they must escape a fearsome Mapusaurus pack, survive natural disasters, brutal discoveries and treachery. So if you know my family at all you know that dinosaurs play a large part in our daily life. My oldest daughter is completely fascinated with the science of Paleontology and could rival most Paleontologist in her knowledge of dinosaur science, ha. Sufficed to say that when this came across my desk I jumped at the chance to read it even though Sci-Fi is not my typical go to for a genre preference. I really wanted to read it in hopes that maybe it would be a book that would interest my daughter and would be appropriate for her 12 year old age. What I can say is an absolute YES to both of those things. outlook. I loved him for the fact that he's this nerdy kid, who is a bit of a social recluse, and what I imagine to be a lanky somewhat awkward kid (reminds me of my oldest, lol) who is the bravest of the bunch. I love that Stephen takes the perception that the nerdy kids aren't as good as the athletic/rich/beautiful, etc ones and turns it on it's head. He proves that every one is a hero when a hero is needed. I also really enjoyed meeting the character that becomes Tim's best friend Woodsy, even when Woodsy grates on my nerves, haha. He is the antithesis of Tim, outgoing, bubbly, a tad wild, a trouble maker but yet still pure of heart. He will drive you a bit batty with his brashness, but her brings a much needed humor in to lighten the drama. With that said I am going to walk away from some of the characters for a bit only because there are a LOT of players in this book and I could spend three days talking about them all before ever telling you who everyone is and what their role in the story is. I also am not a fan of spoilers, I actually bore them, so I don't want to go much more in to detail about who's who and all that, but I had to tell you about Tim and Woodsy. So what's this book really about you may be wondering. Well, it's fairly simple and terribly complex all at the same time. The world as WE know it is gone. The earth is over populated, resources are dying out, crime is on the rise...the only hope, MARS. Travel to Mars has become fairly easy, though not easy enough for the whole planet to just pick up and go, and groups of people have slowly been going over and transforming the Mars we know today into a world that can be inhabited by humans. Our cast of characters the we met in the first pages have all been selected as a group of 100 to take the quick and easy journey and begin to create a new settlement for future inhabitants. Things aren't always what they seem of course and their quick journey turns into a "3 hour Gilligan Style tour" that places everyone in peril and 100 million years in their past! DINOSAURS! 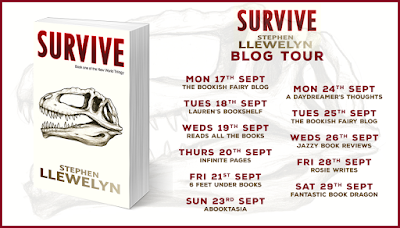 I thoroughly enjoyed the way that Stephen Llewelyn set up this book, the little snips in each chapter the kind of bounce between the characters and the action. It gives the feel of multiple stories in a continuous line if that makes any sense at all. It read to me like a movie script might so one minute you might be calm and hanging with the 'kids' and the next you're discovering a dinosaur and running for your life. It kept the action at a fast place and keeps the reader actively turning pages and not wanting to set the book down for fear of what you might miss. 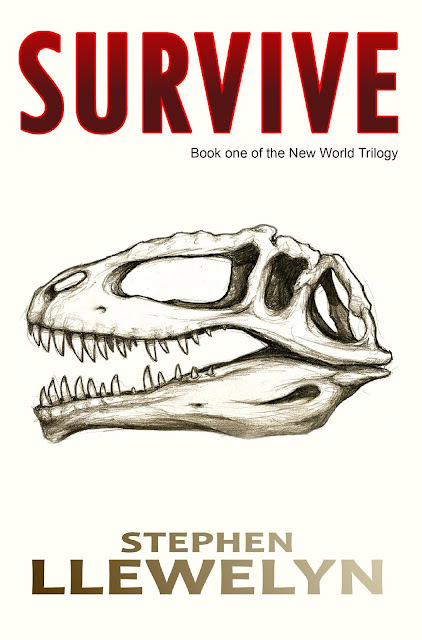 If you are a fan of Sci-Fi and dinosaurs grab this book. The dinos aren't as a factor in this book but the science fiction aspects are all there and we have two more books to go, with no telling what is coming for this cast around the corner! Originally from Dudley in the West Midlands, Stephen Llewelyn works in construction. 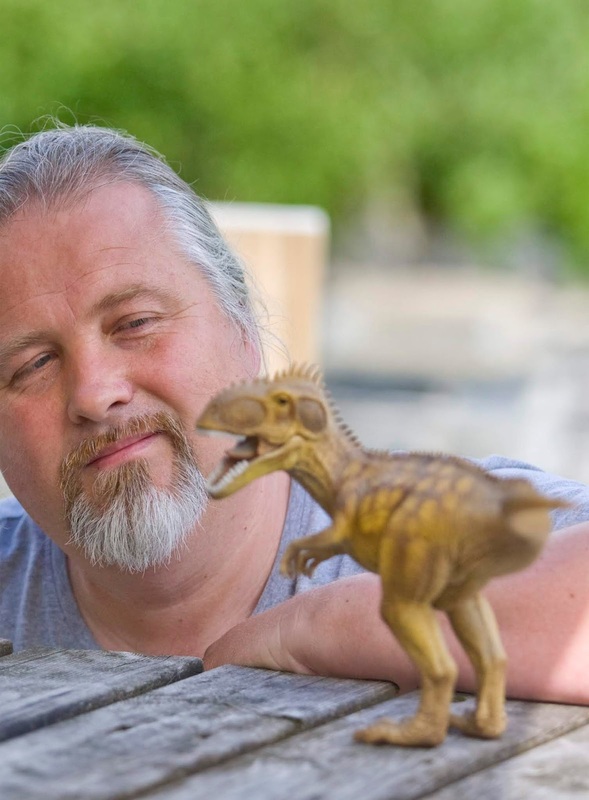 Years spent digging into the foundations of ancient buildings, steeped in a vivid sense of the past, inspired his research into palaeontology and, in turn, shaped his inventive science fiction trilogy. Llewelyn lives with his wife and their four dogs in the mountains of Snowdonia, North Wales. The cover design for Survive features a line drawing of a Giganotosaurus skull by Hannah Armstrong, a young artist who died in tragic circumstances; Llewelyn plans to donate a percentage of royalties from the sale of Survive to the charity, MIND, in Hannah’s memory.